MIRAGE HOTEL MURDER AND TORTURE DOLPHINS | "OUR WORLD"
The MGM-owned Mirage Hotel and Casino may be one of the more recognizable names on the Las Vegas strip — but this carefully-constructed fantasyland getaway is host to a little-known, yet completely disturbing reality for ten animals who are held as living props for the resort’s Polynesian theme. 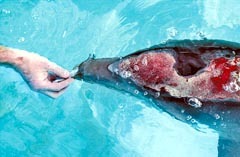 For the last two decades, the Mirage has kept bottlenose dolphins in two open-air pools tucked away on the hotel grounds. A few times a day, they are made to perform tricks for small crowds of guests, though mostly they swim restlessly, without stimulation and only little respite from the sun’s intense rays and the desert’s scorching heat.